It was nice today, ahead of a predicted 4 inches of snow tomorrow. I don't know where this storm is coming from because there's no wind, and no storms showing on the current radar. Supposedly it will sneak in here around 11 pm tonight and last through tomorrow. 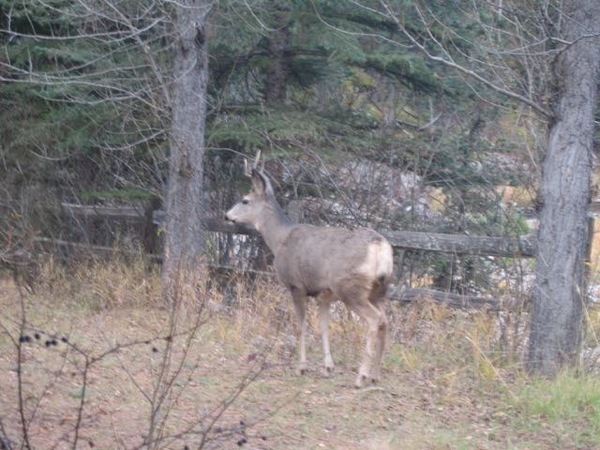 This morning a small herd of deer came through the yard. We don't see them very often, so it's nice to know they're still around, and they are looking healthy this year. There weren't any fawns, though, only a couple yearlings. Usually we see at least one pair of twin fawns in the summer, but none this year. It was the same with the bears: didn't see any bear cubs, and nobody in the area who reported bears mentioned cubs. The bighorn sheep have been spending a lot of time near and on the highway lately, and it always causes a traffic jam. They don't dart across the road like the deer, are more likely to walk along it, so there's less risk of hitting them as long as everyone keeps an eye out. 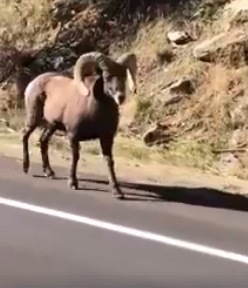 I would like to see bighorn sheep walking alongside the road just like pedestrians. But it would make me slow down enormously, for fear they'd turn and go onto the road like deer. But we give them a wide berth. The bighorns don't dart around on/across the highway like deer, they always act like they have an equal right to use the road as the cars, and it's easier to predict what they will do next. "it's nice to know they're still around" This is good Around here there is more development and conversion of land. We can see the developments growing up around here within the next 20 years - the land use planners are talking about it, but no solutions because of private property right for people to do what they want with their land. Oh, that fox! There was a big epidemic of mange in wild animals around here, and I think that might be what did him in. We really miss him. There was another fox that had potential to be a friend, but our cat Eloise chased him/her up the mountain a couple of times and it stopped coming around during daylight hours. It got down to the twenties here yesterday and a lot of leaves came tumbling down. It is too cold to go outside and rake them so I guess I will have to find someone to do it, which means waiting until they are all down. Or a big wind to blow them down the street. And all we have to deal with are crocodiles, alligators, boa constrictors and other reptiles in Fort Lauderdale--now the rest of the State is something else!! Is this the same family of deer that come around every year? It's most likely the same herd of deer we've seen before, or parts of it. There was a doe in the canyon with a notched ear that everyone looked out for, but it was killed along the highway this summer - someone posted about it on Facebook, referred to it as Notch Ear, and everyone knew which one it was.